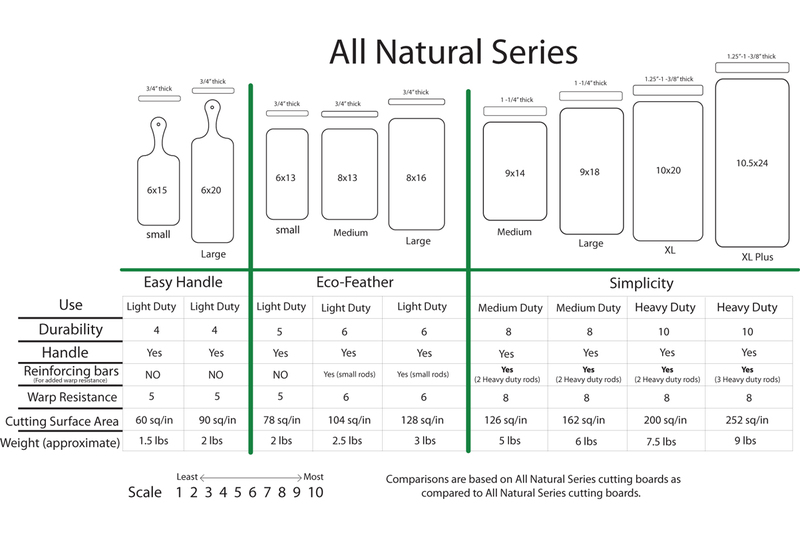 Our All Natural Simplicity Series Line of cutting boards, perfect for all of your heavy duty cutting or chopping needs. It is approximately 10" Deep x 20" Wide x (1.25"-1 3/8") thick. (Sizes can vary slightly +-1/4"-3/8" as each of these are custom made from one piece of wood) This is the perfect sized board for someone who cooks large meals but does not want a cutting board that is too big and takes up too much counter space or storage space. The XL is approximately 200 square inches of cutting surface. Compared to our already substantial All Natural Series Large it has almost 25% more cutting surface (large is 160 square inches surface). (Coconuts are NOT part of the tree nut family their name is a misnomer). Coconuts resist rancidity also, as well as having antibacterial and anti fungal properties.That being said, we are NOT a nut free facility and your board will have had contact with Walnut wood as we make Walnut boards as well. It's exactly what we wanted - and it's just beautiful. The size, the shape, the feel of it....we love it. Could not be more pleased. This cutting board is amazing! I searched high and low for a cutting board that was all natural and contains no glues. So happy I found this company! It so hard to find a even partially natural cutting board. We not only got one,but two. We got to choose the natural finish, which helped my immune issues too. The boards are solid, grip well, are rather light for how solid they are. We like the workmanship and durability. We are chopping vegetables, sweet potato, and squashes, so we really used it for more than a month now and it is holding up great. This is my "Big Betty" for cutting up veggies, with lots of room. Nothing falls off, and I can keep everything separate. This is a heavy board, and it's beautiful so you can just proudly leave it on your kitchen counter. I'm hoping to chop veggies for many years to come...let's see if I can wear it down! I dare you too. This is a very high quality board, and I LOVE my Urthware! It feels and sounds great under the knife. I'm proud and pleased to purchase this from a Canadian craftsman. We use this product every weekend and just received our second one. It's a pleasure to work on. Thank you!